A few months back, when Manushi Chillar became Miss World, every bit of internet was fledged with her name, images, history, and achievements. How many of us know the name of Manu Bhaker? Are we really aware of what she has done for our country? Well, that’s the difference between the glamorous world and sports world. Now, if we talk about sports only, the amplitude influence of cricket has constructed an iron fencing around us, we hardly bother to cross. 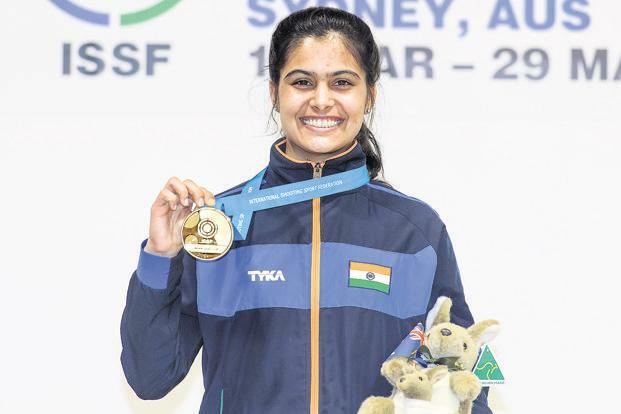 Manu Bhaker, a rising sensation, won the double gold medal in ISSF Junior World Cup in Sydney, Australia, following her maiden senior Shooting World Cup win in Mexico earlier this month. Hailing from Goria village in Haryana’s Jhajjar district is just 16 years old. She had tried shooting at her school in 2016 and a sense of competition emerged out of her veins regarding this sport. Earlier she has done boxing, skating, kabbadi, karate, cricket, and thang ta for the shooting was not her first choice. She used to travel a long way to practice in regular shooting classes and would take extra evening classes at school to make up for what she’d missed in studies. Her hard work showed up its color when in the 10m air pistol final in Gwadaljara, Mexico, this teenager stood against local favorite Alejandra Zavala. Bhaker with her determined mind made her final shot to 10.7, while Zavala a two-time World Cup Gold medalist could only be managed to 8.8. Her journey to the Gold medal was not easy and is just a beginning of the new the paved paths that are laid beneath her feet. She has made it to the squad for the Common Wealth Games to be held in April under the coaching of former shooter Jaspal Rana. Let’s appreciate these personalities, who are working for the betterment of our country in the best possible way. Value them, admire them for they are the real diamonds that are just emerged out of the coal mine to be fixed in a crown.